Welcome to my 3rd party tracking page. I post all my pre-fight bets in here, with the exception of huge parlays or special bets for the Degenerates. Those can be found on my Twitter or official site. I have over 40+ units in 2016 tracked independently on my site over 6 months and decided I should begin 3rd party tracking as soon as possible to leave an unarguable track record. I try to focus on straight picks and Over/Under plays as much as possible, since specific props are not widely available and have lower limits. 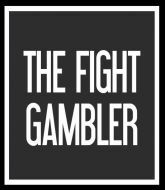 TheFightGambler is a handicapping project that was started as an initial test for my skills and is continuing to evolve into a bigger and better beast to both increase my bankroll and provide services for newer bettors looking for help or information. I incorporate a blend of tape-study, general fight statistics, and other expert advice and tipster consensus that I weigh against my own. I have a long-term goal of a $1,000,000 bankroll and expect to meet it within 10 years. Please visit my official site www.thefightgambler.com for more resources, including bookie reviews and guides for new gamblers. Follow my Twitter @FightGambler on fight nights to tail my in-play betting tips as I place them live. Some bets that I place are part of an in-play strategy to hedge them live, so the bets here only show a part of my overall gameplan. Paid Pick: Hidden Prop Bet (Prop Picking Winner). Buy TheFightGambler 's MMA Picks!